To top off the soup, I made a multi-color tomato pico de gallo. The pico adds a nice cooling balance to the soup. 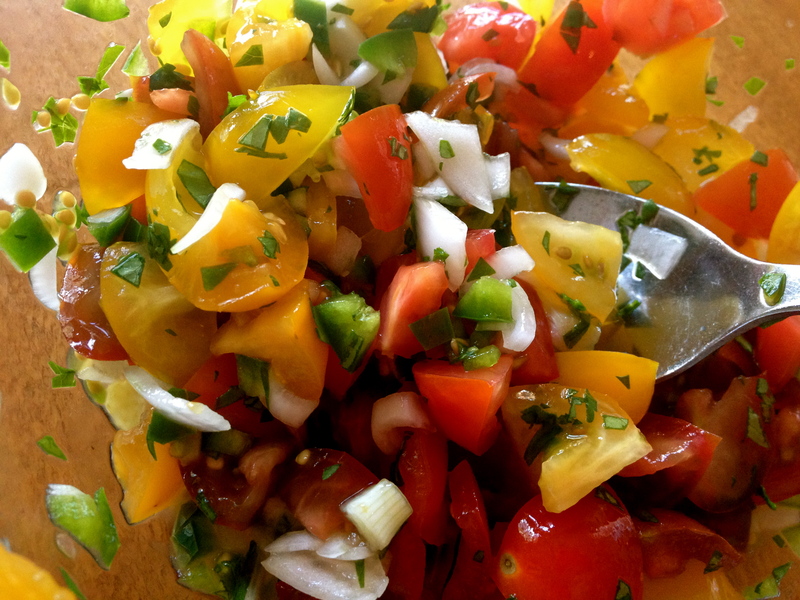 And it’s so easy to make: just chop tomatoes, onion, jalapeno, cilantro and add a little lime juice. Pico de gallo is a condiment that is found just about everywhere here in Houston. My local grocery store makes it fresh every day, which is nice when I don’t have time to make my own. The soup can be served warm or cold. I had it warm for dinner tonight because I couldn’t wait for it to cool off. But tomorrow I’m going cold all the way. Steam potato cubes in a steamer basket set over boiling water in a stock pot. Steam until fork tender, about 20 minutes. Precook corn on the cob in boiling water for about 10 minutes or microwave by wrapping in paper towel and cook for 2-4 minutes. Preheat grill to medium high. 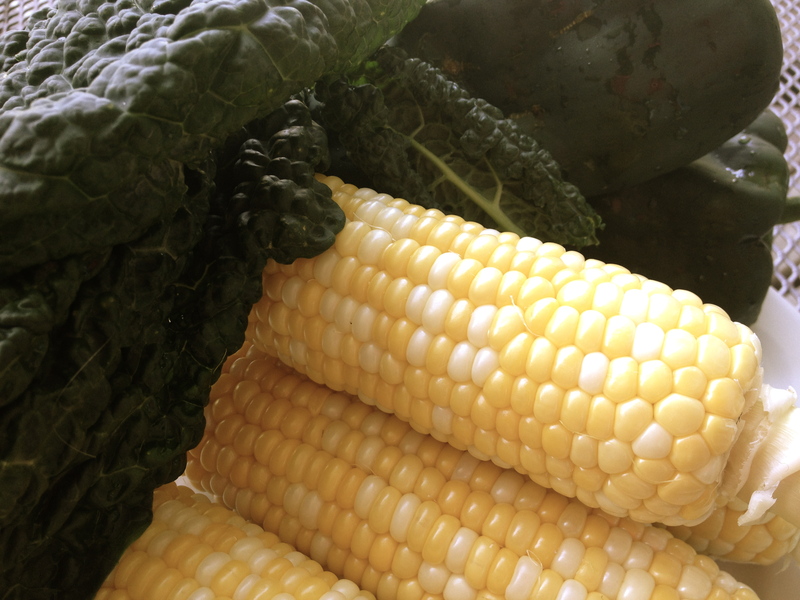 Rub a little olive oil over cooked corn, peppers and kale. Sprinkle with salt. Grill until brown spots appear on vegetables. The kale will only take a few minutes, so watch it carefully. Cut corn from cob and set aside. Let peppers cool, remove blistered skin and chop. Chop kale into thin strips. Heat a stock pot over medium high heat. Add a teaspoon of olive oil. Saute onions and garlic until softened, but not browned. 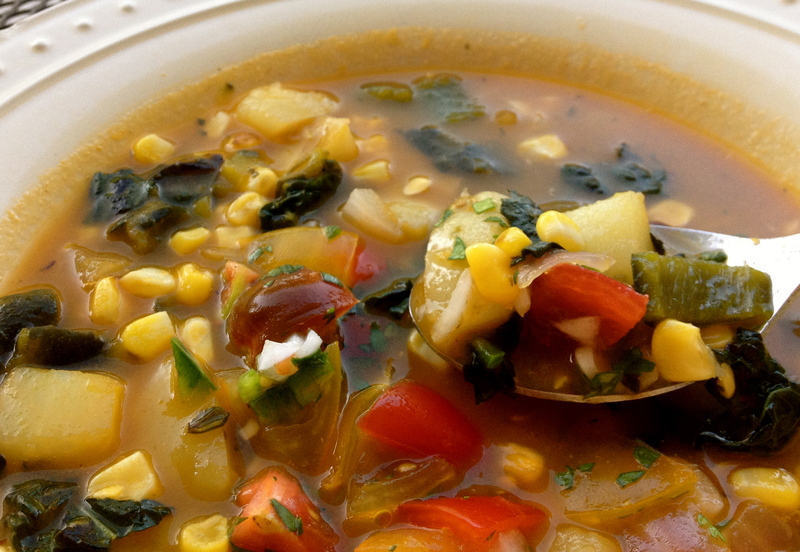 Add steamed potato cubes, corn, chopped poblano peppers, kale and vegetable broth. Bring to a boil. Simmer for about 20 minutes to let flavors blend. Serve immediately or refrigerate at least an hour and serve cold. Top with pico de gallo (recipe follows). In a small bowl, combine all ingredients. Add salt to taste.